Four-year-olds get to play with Power Wheels, teenagers get to drive real cars, but how do all those kids in-between quench their need for speed? With the new Arrow Smart-Kart from Actev Motors that sounds as feature-packed as a Tesla Model S, without the $70,000 price tag. There are actually a few different features that rightfully earn the Arrow go-kart its ‘smart’ moniker. Even though it was designed by professional racecar drivers and tops out at a brisk 12 miles per hour, the kart still prioritizes safety as much as it does driving fun. For example, a collision sensor mounted on the front of the Arrow will automatically stop the kart before it’s involved in a head-on crash that could damage both the vehicle and the driver. For kids who haven’t quite honed their reflexes, that alone could make the Arrow worthwhile. 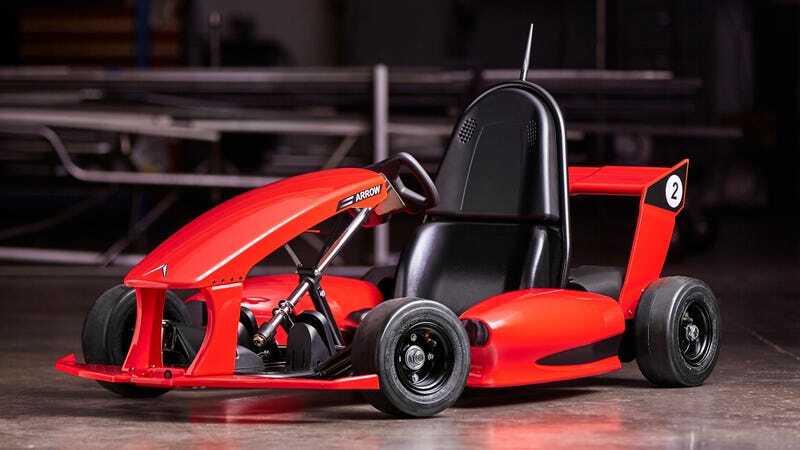 But the Smart Kart also connects to a free iOS and Android smartphone app over wi-fi allowing parents to limit the go-kart’s speed, range, and other capabilities. The Arrow Smart Kart is primarily designed for kids aged five to nine (although if an adult was able to squeeze into the tiny vehicle it actually supports riders up to 200 pounds) and as a young driver gets accustomed to controlling the kart without crashing, parents can slowly increase its top speed using the app. The Smart Kart also supports geo-fencing, so using the app parents can limit exactly how far a child can drive it. An onboard GPS tracker will automatically slow the vehicle to a crawl when it breaks a geo-fence barrier, which encourages kids to return to the pre-designated area so they can drive at full speed again. The Arrow’s accompanying app also has an emergency stop feature that completely shuts down the Smart Kart with the tap of a button. There’s notifications, including when the kart’s collision avoidance feature has been activated, or when the Arrow has been motionless for a set amount of time, indicating a possible problem. And it even keeps track of driving stats like time, distance, and speeds. On a full charge the Arrow will run for anywhere from 30 minutes to a full hour, depending on where or how fast the kart is being driven. If a kid has the pedal to the metal as they climb a mountain switchback, expect battery life to be closer to half an hour. Charging the battery is an overnight affair using the charger included with the kart, but a fast charger will also be available as an optional accessory, as well as additional batteries that can be quickly swapped out. In fact, accessories and add-ons will be a big part of the whole Arrow experience. The kart is available for pre-order starting today for $600, but that’s just the tip of the iceberg. Everything from custom body kits, to drifting wheel rings, to smart cones, to steering wheel upgrades will be available. Even the app has some clever ways to squeeze a few more bucks out of mom or dad with various synthesized engine sound effects that can be downloaded and shared to the vehicle. So if you’ve got a kid who seemingly can’t wait until they’re 16 to get behind the wheel, the Arrow Smart Kart could be a great way to tide them over, and maybe even teach them the basics of the road before you have to nervously climb in the passenger seat one day while helping them get their license.